Initial Registration / Forgot Password? A car is made up of approximately 10,000 individual parts and round about 40 different materials. In order to ensure that both quality and safety are maintained throughout every assembly and all parts work together faultlessly, sophisticated quality management is an absolute necessity. It therefore comes as no surprise that probably no other industry has done so much for the evolution of quality assurance and the standardization of processes in the past century, as the automotive industry has. This focus on quality led to the introduction of quality systems throughout the automotive sector which are primarily governed by quality standards such as ISO 9001 and ISO/TS 16949. Maintaining these complex systems and their associated tools, however, is difficult with pen and paper or MS Excel solutions alone. Contemporary CAQ-systems are tailor-made to meet these requirements as they offer everything that is needed for sophisticated quality assurance and management from Control Plan, SPC, and inspection planning to initial sample inspections, gauge management, or the risk management tool FMEA. 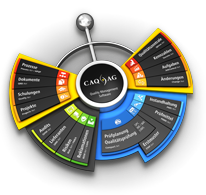 Practising quality management with a CAQ-system like CAQ.Net® essentially incorporates the best techniques and guidelines that the automotive world has to offer: from the German VDA with its variety of VDA volumes and the QDX file format via the US-American QS 9000 with its APQP, FMEA, and production control plans to the Japanese quality and production concepts such as Kaizen, Jidoka, Kanban und Poka Yoke with their Ishikawa diagrams and 5-Why techniques. Most notably, CAQ.Net® facilitates perfect adherence to the ISO/TS 16949 standard. This standard was born from the US-American QS 9000 and is structurally based on the ISO 9001. It harmonizes the individual regulations of the various international automobile organizations and is used by approximately 30 percent of all international carmakers, including all major German carmakers. If one takes a closer look at the ISO/TS 16949, one soon realizes that it basically resembles an “ISO 9001 Plus”. The general quality management standard ISO 9001 was effectively tightened by the IATF and supplemented with a variety of tools. With APQP, SPC, control plan, FMEA, MSA, and PPAP, tools were adopted from the QS 9000 that placed a greater focus on customer specific requirements. By concentrating on the continuous improvement process, the standard also more strongly emphasizes the necessity to prevent errors before they occur as opposed to merely detecting them when they occur. The automotive sector is subject to a number of strict market factors such as an ever more globalized theatre of production and distribution, rapid model changes, safety and environmental constraints, fuel efficiency efforts, and increasingly aggressive levels of international competition. All these factors create a global marketplace in which the quality of the finished product is of paramount importance. The continuously implemented quality assurance measures required for achieving the necessary quality levels, however, produce a tremendous volume of data, which is not manageable with pen and paper or MS Excel solutions alone. This is where CAQ solutions such as CAQ AG’s CAQ.Net® software come into play and provide the perfect system with which to facilitate success in the difficult, highly competitive, and rapidly changing automotive environment. CAQ.Net®’s portfolio provides everything that is required for sophisticated quality management as well as the necessary tools to achieve and uphold ISO 9001 and ISO/TS 16949 certifications. One of the main factors for being able to successfully uphold the regulations of the ISO/TS 16949, is data transparency. With CAQ.Net® said transparency is achieved by having instant access to all data relating to the quality assurance procedures along the entire production chain. This means that, for instance, data from complaints can be used directly during inspection planning, locked gauges cannot be used for inspections, and the FMEA is connected directly to the production control plan. The entire quality management system is monitored via a central quality control module. It allows the user to select individual persons, customers, suppliers, articles, machines, or processes and receive precise, real-time feedback regarding the data of the selected entity from throughout the entire system. With CAQ.Net®, the idea of data transparency does not stop at the CAQ-system, as the CAQ-system is also connected directly to the ERP-system. A standard interface transfers master and dynamic data between the two systems. This means that all article master data is synchronized and that incoming goods inspections are automatically logged on in the CAQ-system as soon as new incoming goods are registered by the ERP-system. The direct communication between the two systems thereby greatly increases the overall process efficiency in the company. The new version of the ISO 9001-based ISO/TS 16949 is in the final stages of development and the target date for publication is December 2016. Even though it is still unclear specifically what changes will be implemented, the IATF has already mentioned some aspects that will be addressed in greater detail. Some of the new enhancements to the automotive quality standard will regard the requirements for safety-related parts and processes, enhanced product traceability requirements to support latest regulatory changes, a clarification of sub-tier supplier management and development requirements, and the addition of corporate responsibility requirements. Apart from the requests by governing bodies and standards, it is, however, also the desire for Industry 4.0, cyber physical systems, and the internet of things (IoT) that is increasingly driving the degree of digitalisation in the quality management sector. In order to be fit for the future, there is no way around the application of powerful and fully integratable CAQ-software solutions.